Dhaka, July 22 (Just News): Bangladesh Nationalist Party’s central leaders on Sunday resolved that the party would not participate in the next general election without freeing the party chairperson Begum Khaleda Zia. 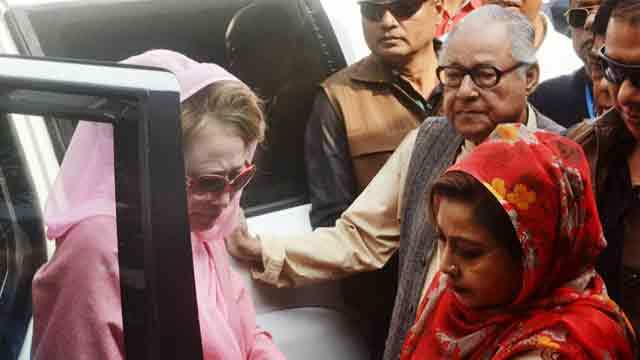 The party’s top executive body, National Executive Committee, in a meeting also decided to intensify the movement to free Khaleda Zia, who was sentenced to five years in jail in a graft case by a special judge’s court on February 8. The meeting held at the party’s central office at Naya Paltan was attended by joint secretary generals, organising secretaries and secretaries of other portfolios. The meeting, presided over by BNP secretary general Mirza Fakhrul Islam Alamgir, emphasised the increasing participation of leaders and activists in all future programmes, according to an organising secretary. BNP’s July 20 rally at Naya Paltan inspired leaders and activists across the country, the meeting observed. After the meeting at a news briefing BNP secretary general Mirza Fakhrul Islam Alamgir alleged that Chhatra League ‘goons’ in cooperation with police attacked daily Amar Desh acting editor Mahmudur Rahman on the premises of Kushtia court. He demanded legal steps against the attackers without any delay. Referring to the incident, Fakhrul said when the lawyers and Mahmudur Rahman sought security from the court, the court called police for help. ‘But the officer-in-charge did not turned up there,’ Fakhrul said adding they had contacted the higher authorities of police, but they did not take any action. Rather police asked Mahmudur and others to go out of the court and almost forcibly hand him over to the ‘thugs’, the BNP leader said. Mahmud with injured in his head was not given any treatment in Kushtia and he was provided with a car to return to Dhaka. The government should send Mahmudur to hospital with police protection, he said.